The NHS lost a wonderful ambassador on the 14th March when Professor Stephen Hawking died. 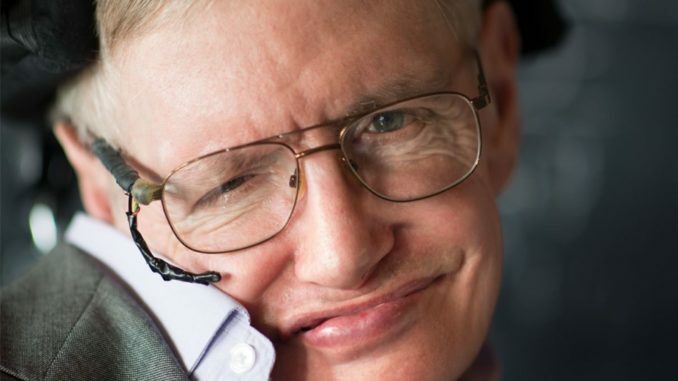 Professor Hawking's intellect and insight shaped modern cosmology and he inspired generations of people through his book A Brief History of Time and beyond. In August 2017 Hawking presented the keynote speech at the Talk NHS debate at the Royal Society of Medicine where he highlighted the negative impact this current Government is having on the NHS and how important a service it provides. 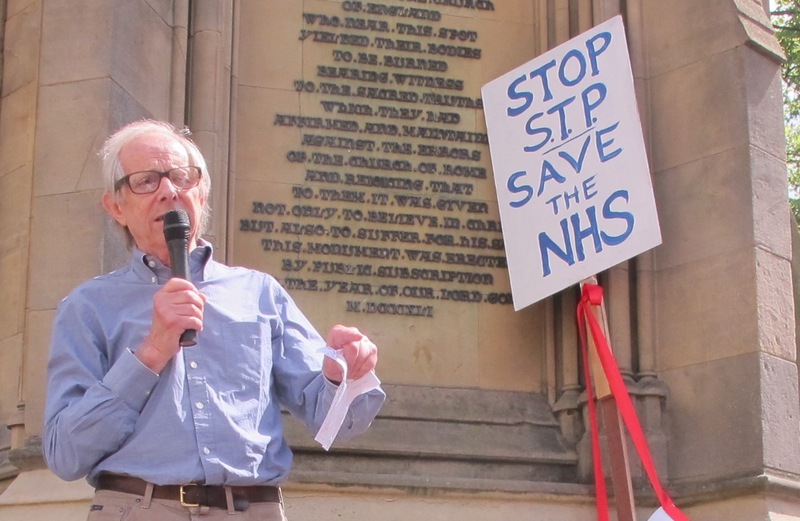 He brought public attention to the plight of the NHS and took on Hunt publicly in The Guardian where he had previously explicitly stated that the Government's privatisation of the NHS would be its downfall. 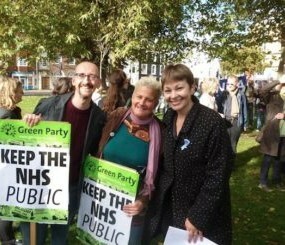 Most recently Professor Hawking joined Dr Colin Hutchinson, Professor Allyson Pollock, Professor Sue Richards and Dr Graham Winyard in their joint intention to take Jeremy Hunt to where he had previously explicitly stated that the Government's Judicial Review over the lack of scrutiny of Accountable Care Organisations. We have written a full-length post in memoriam which can be found on our website. Our deepest sympathies to Professor Hawking's family and friends for their loss. Albert Thompson (not his real name) is 63 years old and has lived in London for 44 years. After major surgery Albert arrived for his first radiotherapy session only to be taken aside and told that unless he can prove he is legally entitled to live in the UK he will have to pay the full £54,000 for his treatment upfront. Albert has paid 3 decades worth of taxes to the British Government. He obviously cannot afford to pay £54,000 for his Cancer treatment. 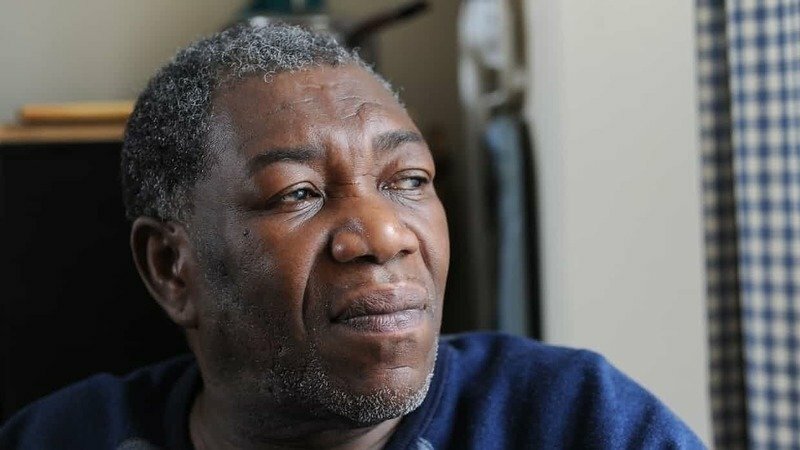 A petition has been started urging the the Home Office to urgently review Albert's status in the UK in order that his treatment can be approved as soon as possible. Given that Theresa May has so far refused to intervene on Albert's behalf please sign the petition and share widely so that The Government cannot get away with ignoring this. The charity Praxis is currently supporting Albert should you wish to donate to them. A subsidiary company (SubCo) is an independent company wholly owned by a parent company that can be set up by NHS trusts. Unfortunately and despite massive opposition from Unison, Unite the Union, the Royal College of Nursing and 900 staff, the Board of Gloucestershire Hospitals has chosen to proceed with its plan to transfer 750 of its lowest-paid staff outside the NHS. The above organisations have released a joint statement damning the decision which can be read here. If you are not already familiar with SubCos and would like to read more about the severe risk they pose to NHS workers and the NHS as a whole then Martin Blanchard from Enfield KONP has written a fantastic post for our website with more details. Jeremy Hunt is calling for a hypothecated tax to fund the NHS including staff pay increases. Member of the KONP Executive Committee, Carol Ackroyd, has written a post for our website detailing KONP's position on how the NHS should be funded. Our stipulation is that the NHS must be funded through general taxation, not regressive National Insurance. 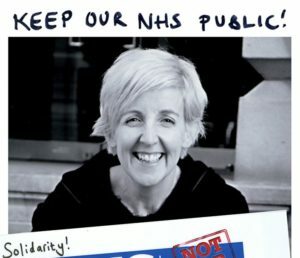 Time and again, surveys have demonstrated that the British public is willing to pay more tax in exchange for well-funded, free and comprehensive healthcare and KONP calls on politicians from all parties to reject these repeated calls for an hypothecated NI tax for the NHS, and to support full and fair funding for the NHS through general taxation. 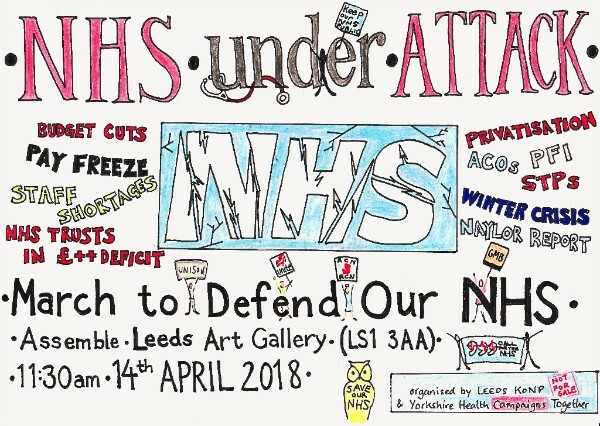 In addition to the JR4NHS there are three more legal challenges that are hoping to bring Jeremy Hunt to account and they need your support. 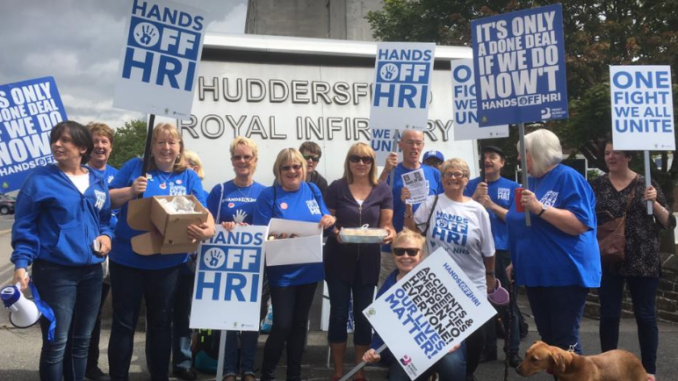 On Thursday March 15th Hands Off HRI (Huddersfield Royal Infirmary) made legal history in the Leeds Crown Court when Judge Mark Gosnall agreed there were important matters of law which must be tested in a full Judicial Review. Congratulations Hands off HRI! They still need your support so please follow the link above for more information. 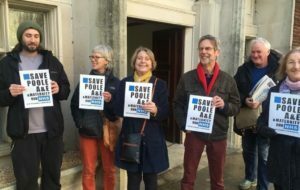 Local campaigners are delighted to report that they have been granted a Full Hearing for Judicial Review (JR) into Dorset CCG’s plans to downgrade one of the county’s three A&Es, close one of three maternity units with a second under threat, close community hospitals and/or beds in 5 of 13 Dorset locations, and close 245 acute beds. They need to raise £100,000 so please head to their Crowdfunding page via the link above. 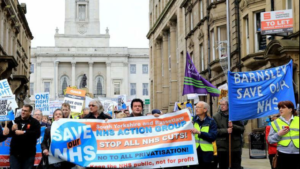 Barnsley Save Our NHS and Rotherham Save Our NHS need your support to help fund a legal challenge to the decision to close their emergency stroke services in both Barnsley and Rotherham local hospitals. We have written in more detail about their individual campaigns here. Please donate generously if you can! Upon request KONP have sent feedback to the Health Select Committee about their experience giving evidence on ACS/ACOs on the 27th February. Transcripts of the evidence can now be found in the resources area of our website under 'accountable (integrated) care organisations and systems'. In addition to the evidence given by KONP co-chair Tony O Sullivan et al we have also included transcripts from later hearings. 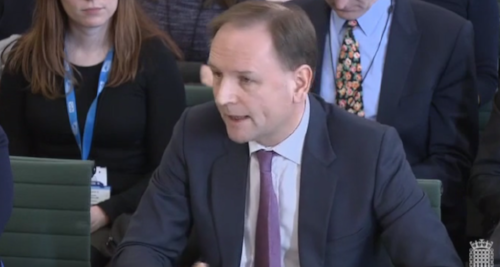 One transcript is oral evidence that was given by NHS Organisations on the 6 March and the other, recorded on 20 March, is evidence from Simon Stevens which makes for particularly interesting reading. The British Medical Journal (BMJ) recently reported figures that showed a rise in mortality in England and Wales in first seven weeks of 2018. They showed that over these seven weeks, 93,990 people died in England and Wales and over the same weeks in the previous five years, an average of 83,615 people died. This is a rise of 12.4 percent. In the article it was ruled out that the extra 10,000 deaths could be due to cold weather, flu or an ageing population and called on Health Chiefs to properly investigate the dramatic rise. It seems obvious to KONP that these extra 10,000 deaths are a direct result of the cuts this Government has subjected our public services to through their austerity. The University of Oxford wrote an article in February 2017 linking an excess 30,000 deaths in 2015 to the Government’s cuts to Health and Social Care. Similar logic can be applied here. Two weeks ago, Justice for Hadiza Bawa Garba handed in letters to the General Nursing & Midwifery Council and the General Medical Council protesting their striking off of nurse Isabel Amaro (who was imprisoned) and Hadiza. 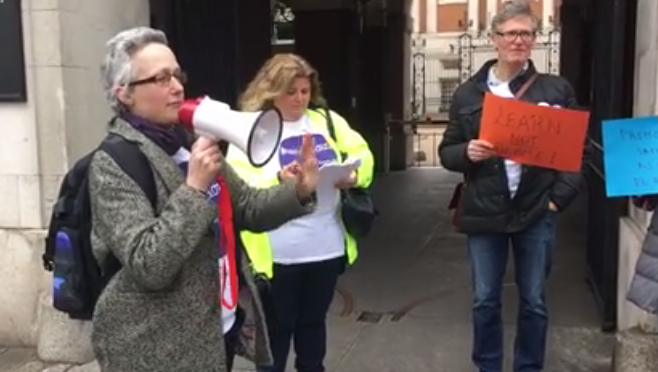 A video by available on KONP's Facebook Pageshows Dr Jenny Vaughan raising concerns of systemic discrimination where she gives voice to deep concerns that the vast majority of doctors struck off after similar circumstances are black and minority ethnic staff. #IamHadiza - Stop the blame culture! Two NHS trusts have challenged the lawfulness of Lancashire County Council's award of a £100m children's service contract to Virgin Care. The judge has ruled that merely paying damages to the two NHS Trusts would not make up for 'the disruption and damage to the provision of the whole range of healthcare' that pulling the children’s services brick out of the whole NHS building would cause. This ruling against Lancashire comes weeks after Surrey NHS Commissioners made an out-of-court settlement to Virgin Care of at least £2 million which had planned to go to court to challenge the award of the Surrey children’s services contract to the NHS. There is to be a full hearing in April. To read more about this landmark ruling please see Calderdale and Kirklees 999 call for the NHS' detailed article. Congratulations to KONP North East on a wonderful month of campaigning. 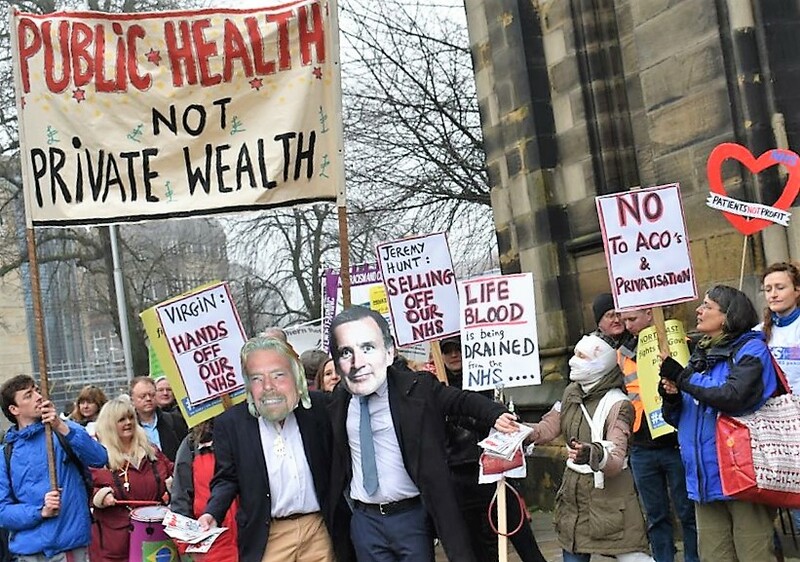 On 10 March more than 1,000 people attended KONP North East's march and rally to demand a healthy NHS. There is a brilliant video here and the day was reported on Metro Radio on the hour, Tyne Tees and BBC TV news and the Journal and Chronicle newspapers. Please head to the KONPNE website for more photos and videos from the day. 'This council agrees that there is a growing body of evidence to question the wisdom of ....Accountable Care Organisations/Integrated Care Systems (ACO/ICS) ... This council agrees to oppose any proposal to implement the delivery of healthcare in North Tyneside via ACO/ICS, a project which in the North Tyneside CCG's own report was stated to be high risk.' Councillors Lesley Spillard, Sarah Day, and Wendy Lott who brought the motion to the council, and to Councillors Leslie Miller, Kenneth Barrie, Margaret Hall, Gary Bell, and Alison Wagott-Fairley all spoke in favour of the motion. Well done to them and congratulations to all campaigners in Tyneside who have put so much effort into protecting our NHS. Please head to KONP North East's website or Facebook page to get involved. A huge welcome to our new group CovKONP who have recently affiliated as a local group and really hit the ground running. They organised a rally on Saturday 3rd March in Coventry which received press coverage on BBC Cov & Warks Radio (1 hour 10 minutes in) and BBC Midlands Today . Great work and welcome!! To get involved with their campaign please join their Facebook group or email Julie. 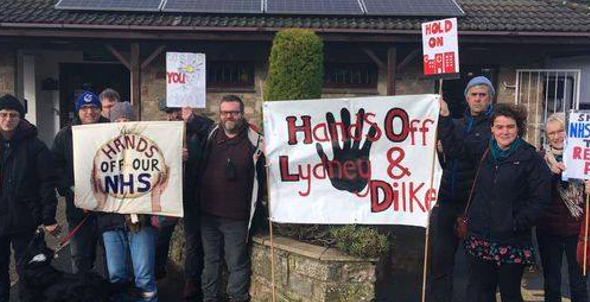 The HOLD Campaign are a group of passionate residents from the Forest of Dean who are committed to fighting to ensure that the best health and social care is provided for the residents of the Forest of Dean. On January 25, NHS Gloucestershire Clinical Commissioning Group decided to approve the closure of 2 community hospitals, despite considerable opposition from the community. They believe the decision was unlawful and are applying for a Judicial Review (JR) to determine this. They need your help and are fundraising for the JR, please head to their crowdfunding page for more information or to make a donation. 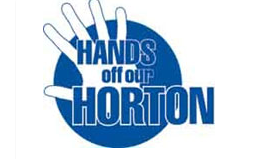 Congratulations to all those campaigners who worked so hard to save the Horton Hospital from closure. The Consultation Institute has reported that Secretary of State for Health, Jeremy Hunt, has accepted the Independent Reconfiguration Panel (IRP)’s critique of Oxfordshire CCG’s plans to close consultant-led maternity services in Banbury. Though the public hearing bought before the judge on 6 December 2017 was not successful this is an excellent development and proof of the power of continued campaigning! On 28 March 2018 it was announced that Shropshire would be receiving £312m STP capital funding. Representatives from our local KONP group, Shropshire Defend Our NHS, have said that that it is the funding needed to implement the Government's cuts programme in the acute hospitals. 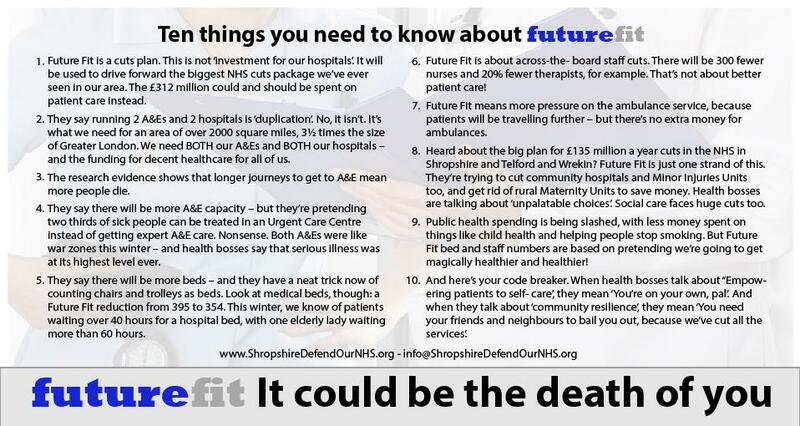 They have responded to the announcement by pointing out that not one penny of the £312 million ‘investment’ is for frontline healthcare and have given a damning report of what 'NHS FutureFit' really means for our NHS. You can read their statement here. TUC and London East and South East Pensioners’ Network Annual Seminar Mon 9 April 2018, 10:00 to 15:30 Congress House, 23-28 Great Russell Street, WC1B 3LS London Every week we hear about failures in the care services: neglect and ill-treatment in residential homes, limited care times, and poor service in users’ own homes. This is aggravated by the bad working conditions and low pay of carers. In 2016 LESE asked what can be done to support and improve conditions both for service users and service providers. This seminar is a follow-on and will outline the problems of the system, point to new ways forward, and give participants the opportunity to express their own views. Insist local councillors refuse to support the creation of Accountable/Integrated Care Systems, which will break up the NHS and fast track privatisation. HCT and The People's Assembly have called for a day of protest in London on 30 June to tie in with a celebration of the NHS' 70th year. We've made some additions to our website. We have added a Who We Are page which details who makes up our Executive Committee and staff team. We have added a Video Listings area to our resource section. If you have any videos you would like to be added please email Bri via activity@keepournhspublic.com. Finally we have a new Patrons area of the website. Many thanks to Terry Tallis who has been recruiting our new patrons and whose work is ongoing. We will be adding more photos and bios as they come in. We need your help more than ever. Please consider helping us in our campaigning by joining or donating. There are many appeals at present. Please remember KONP and consider a regular contribution however small – even £1 per month helps secure our ability to campaign. For instructions on how to join please head to our website.